Brrrrr! Many people are starting to feel the winter weather creeping up on them. We all do our best to avoid the cold, but sometimes going outdoors in frigid temperatures is unavoidable. And going out into the cold, snow, and wind with a young child can add an extra layer of challenge. Parents and caregivers will have to do a little more planning to make sure little ones are safe and warm. 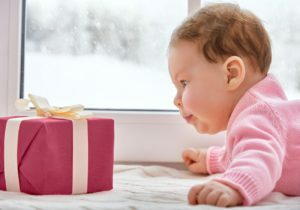 While very young babies should avoid extreme temperatures whenever possible, if your child is over 6 months old, small periods of being outdoors should be alright. Use these tips to help ensure they are comfortable during your outdoor adventures! -Don’t wear jackets in car seats. Bulky clothing including jackets and snowsuits should not be worn underneath the safety harness. Instead, add a blanket over the harness for extra warmth. To avoid extra layers you can carry baby in a blanket to the car. Older kids could put their coats on backwards (on the front of their bodies) when going a short distance, like from the house to the car, to easily be able to pull of their coat once they get into the car. -Keep the carrier indoors. If possible, keep the removable carrier aspect of the car seat indoors so it’s not cold when you first put baby in the car. -Wear layers. Don’t forget what a big difference the wind chill can make! A general rule from the American Academy of Pediatrics (APP) is infants should wear one more layer than adults are wearing. Layering is helpful in case you notice your kids are too hot and actually sweating once they are outside. -Keep winter accessories handy. Keep extra hats, gloves, mittens, and socks in the car and stroller. If these items get wet in the snow or slush, change them right away. 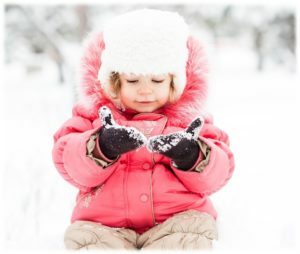 Cold clothing can make your little ones even colder! -Being outdoors can dry up baby’s skin. Once back inside be sure to use plenty of baby-safe lotion. -Be sure to cover up fingers, toes, and ears. These places are likely to get cold the quickest. Hats are essential for keeping baby warm! By using these tips your family does not have to be stuck inside all winter. Walks, quick trips to the park, and playing outside are all okay during cold, winter months with extra preparation—and maybe an extra layer too! Want more info to help with baby? 14 tips to baby proof your home! Your first holiday with baby might be a little stressful. These tips might help you to prepare and make things a little easier.